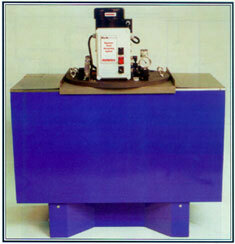 Parts Washers:Waste Wizard-An Industrial Fluid Recycling Phenomenon! An Industrial Fluid Recycling Phenomenon! Membrex's Waste Wizard Plus is a revolutionary new filtration technology for recycling of aqueous cleaner baths, mass finishing compounds, mop water and certain other water based industrial fluids. Designed as low maintenance, point-of-use device for the factory, the Waste Wizard + system employs a patented process to filter out and collect the soils that reduce the useful life of these valuable fluids. Cleaners and finishing compounds are recycled continuously to keep the process sump clean and to extend the useful life of the fluid by as much as 10 times or more. In addition, oil and solid contaminants are concentrated to high levels inside a standard waste drum or small tank for convenient, cost effective disposal. The Waste Wizard's ability to recycle cleaners and finishing compounds continuously is unparalleled and can save many thousands of dollars in chemical usage, labor, waste processing and hauling. In addition, Waste Wizard Plus recycled fluids will save on product rework costs by improving cleaning /finishing quality and consitency that typically go off-spec as the oil and dirt contaminants build up in the process sump. No other recycling technology can match the ease-of-use, reliability and performance of Membrex's new Waste Wizard Plus System. If you have been waiting for a recycling solution that can both improve product quality and pay for its self out of immediate savings on cleaner, labor and waste water processing...your Waste Wizzard Plus System is here! Affordable point-of-use recycling for aqueous cleaners, mass finishing compounds, mop water & synthetic coolants. Inexpensive:pays for itself in just a few months. High solids capability makes Waste Wizard + ideal for recycling mop water and vibratory waste. In addition to systems shown, BCS Company designs, engineers and installs systems manufactured by ALL major membrane, UF and RO companies.